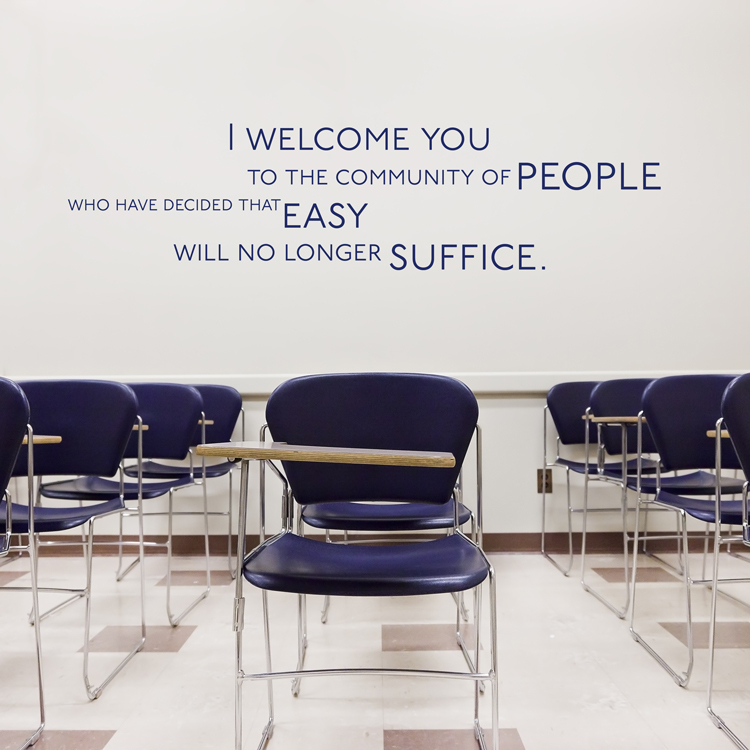 "I Welcome you to the community of people who have decided that easy will no longer suffice." Use this motivational wall decal to remind yourself that mediocre is not an option. Be Awesome! Our wall decals are ideal for bedrooms, offices, living rooms, entryways, classrooms, even your car or glass shower doors! Our wall decals are ideal for bedrooms, offices, living rooms, your local crossfit box, gyms, entryways, classrooms, even your car or glass shower doors! 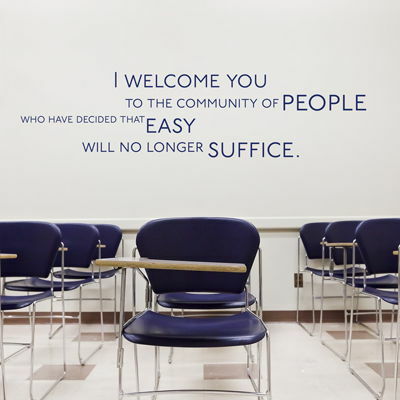 The Large version of this quote wall decal (shown) measures 72 inches wide by 18 inches high, as laid out in image. Small version measures 31 inches wide by 7.5 inches high. This wall decal comes in sections for easier application, and so you can create your own look! Just a quick note to let you know how wonderful the decal is that we ordered from Dali Decals! It is the perfect addition to our babies nursery and it was so easy and fun to put up! My husband was most impressed that our tree looked as good (if not better) that the picture from the internet that we used as our guide! Thank you so much for brightening up our son's room! I would recommend your website and product to all! I have a huge master bedroom wall that I have had several types of art work created to try to fill this space. I was not sure if this decal would be large enough but after I got it on the wall it’s wonderful!! Perfect size and the instillation was easy as 1…2…3. I love the idea of the decals so much I ordered name and design decals for both my kids rooms and several others to put throughout my home. Thank you for your great designs and I am telling all my friends about your amazing company.